Black wedding rings are an easy way to make a statement! If there's one thing that never goes out of style, it's black. Perfect for the classy-yet-contemporary guy with an eye for all things cool, our black wedding rings are timeless, tasteful, and a little bit cutting-edge. Looking for something that's unique and all-you? This is the place where bold begins. 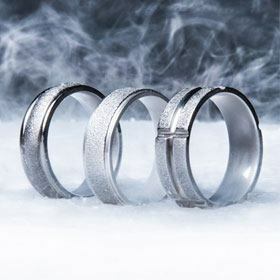 Whether you're looking for super-tough black wedding rings or want to surprise your favorite guy with one of our black lifestyle rings that he can sport wherever he goes, you'll find it in this collection of commanding black wedding rings. 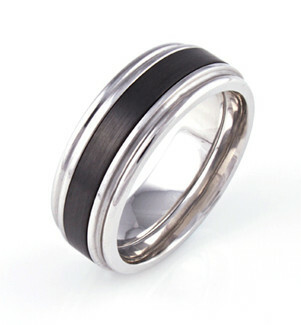 So, how do we create these stunning, sleek black men's wedding bands? The answer is black zirconium. All of our rings start out as regular old non-black zirconium, a natural element that's very similar to titanium. The strong, black finish occurs as a result of a super-heating process that turns the metal a deep, rich black. No coatings, dyes, or paints are added - the vibrant coloration is born from and is solidified during the cooking process. Black zirconium is the perfect choice to make black men's wedding bands for guys looking for tough, black wedding bands that can withstand their active, rugged lifestyles. They're lightweight, strong, and reflective, with comfortable features to ensure that they won't get in your way as you move and work. 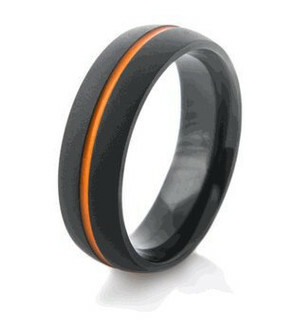 What's more, the ceramic-like finish on our black men's black wedding bands won't wear off. No amount of washing, buffing, or rubbing will diminish the intensity of the surface. Black wedding rings look beautiful. Black zirconium is a highly adaptable material, so we can make many unique designs of black wedding rings from it. 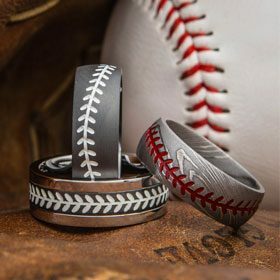 Our selection includes trendy matte black mens wedding bands from our Midnight Matte Collection that capture your cutting-edge sense of style, as well as black camo rings that give a nod to your outdoorsy disposition. If you're all about timeless style, take a peek at our Manhattan Collection that offers black metal rings designed with an urban-inspired feel by combining black zirconium with classic cobalt. 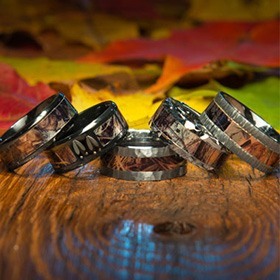 Titanium-Buzz's team also makes black wedding rings for athletes, gearheads, musicians, anglers, and more. Love black on black? Us too. Give your black ring a little bit of luxury and dimension with a black diamond ring set before a sleek, black zirconium backdrop. Our mens black diamond rings look exquisite. These anything-but-average mens black diamond rings feature bold, unconventional designs that suit your personality. If you want a semi-traditional black ring, black with classic sparkling diamonds or mixed stones is a darling choice. Our amazing collection of black metal rings for men includes all-black styles for an edgy feel plus unique options with mixed-material inlays. Complement your fearless, black style with an inlay made of glimmering gold, cool meteorite, tough carbon fiber, or brightly colored fishing wire. We've even got styles in patriotic prints and barbwire designs to show your bold personality. Questions? Comments? Pronouncements? Ideas? Let us know. Give us a call or send us an email. We want to talk to you about whatever you've got on your mind. 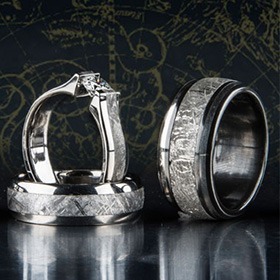 Pay attention to other materials used to create unusual men’s wedding bands.